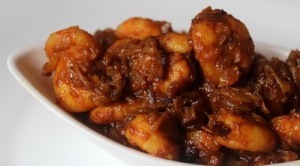 Prawns Masala: Prawns masala is simple yet delicious and packed with flavor. The ingredient which goes in making this prawns masala recipe could be easily found in your kitchen. The recipe involves two ‘steps’ – marinating the prawns and preparing the gravy. Prawns masala goes really well with hot, freshly made chapattis (unleavened Indian flatbread) or plain or jeera rice. Heat the oil in a frying pan, on medium heat. Fry the sliced onions till golden brown. Drain the fried onions and set aside. Add the marinated prawns into the hot oil. Fry the prawns for 2-3 minutes, just to seal them nicely. Drain the prawns and set aside. Note: Do not over-fry the prawns as they will cook some more in the gravy and over-cooking prawns makes them hard/ un-palatable. Add the cumin seeds, cardamom and cinnamon to the oil. Once they splutter, add in the chopped tomatoes. Add a little bit of salt on and fry until the tomatoes till all the moisture evaporates. In the meantime, whip the yoghurt in a bowl. Crush half of the fried onions and add them in the yoghurt. Add in the tomato puree and saffron. Use a fork and whip these ingredients together. Once the tomatoes have dried/dried, add the ginger and garlic. Add in the chopped/slit chillies, turmeric powder and cumin powder. Fry the mixture for a minute. Pour in the yoghurt mixture. Cook the mixture down for about 2-3 minutes until it thickens and no longer has any raw flavour. Add in the fried prawns, remaining fried onions and the potatoes. Simmer the mixture on low heat, giving an occasional stir. Adjust the salt add the remaining green chilli. You can add a bit of water for extra gravy if needed. Prawns masala is ready to be served. Squeeze in the lemon juice and sprinkle the chopped coriander in prawns masala. If you have any queries regarding the Prawns Masala recipe, please leave a comment.